Medicated relief for occasional cold sores, cracked, chapped & sore lips.Strong ammonia solution 0.100% w/w, Aromatic ammonia solution 6.040% w/w, Liquefied phenol 0.494% w/w. Healing - medicated to soothe cold sores & care for your lips Blistex®Relief Cream has a soothing and protective formula to relieve & treat occasional cold sores and cracked & chapped lips, leaving your lips feeling soft again. Cold sores - when first symptoms arise, gently apply every hour to rapidly relieve any discomfort. Cracked and chapped lips - your lips are more sensitive during extreme weather conditions, so you may need a little more care than normal. 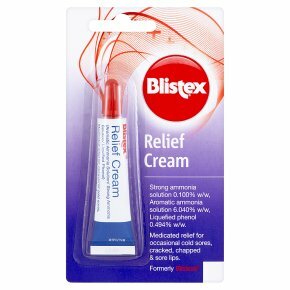 Apply Blistex®Relief Cream frequently to quickly relieve sore, cracked & chapped lips.